If you appreciate lots of space, comfort and character then The Norfolk Chantry has the ingredients for a wonderful holiday or well earned break. 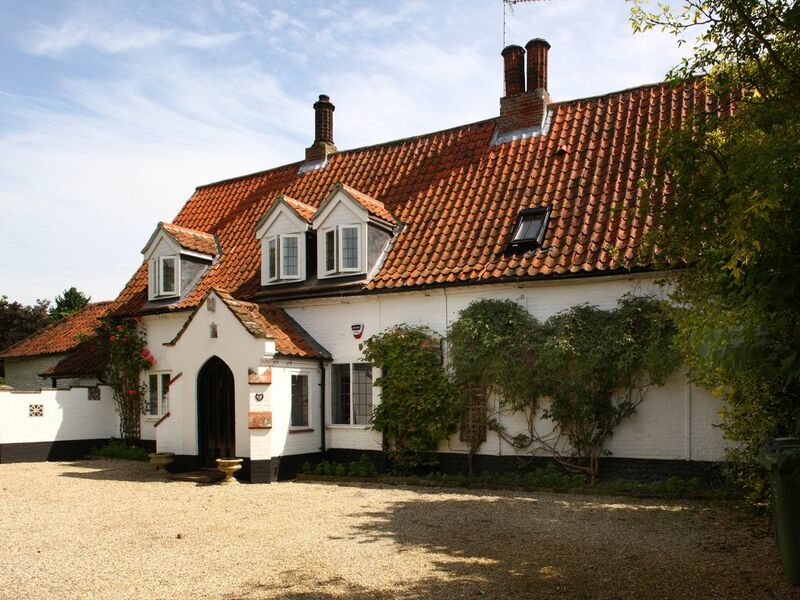 South Creake is lovely village in a conservation area that is just 4 miles from Burnham Market and 6 miles from the sea, making it an ideal base from which to explore and enjoy Norfolk's huge beaches, picturesque villages and fine hostelries. The Chantry is an old Norfolk farmhouse which is now a spacious 5 bedroom 3,500 sq feet home that has just been fully renovated and redecorated. Our private garden is nearly an acre in size and has been lovingly tended by the same gardener for over 30 years. There is a large area of lawn, mature flower borders and spectacular specimen plants such as the Wisteria that covers the flint barn in the garden, home grown magnolias and clematis. There is also a large patio, garden furniture and barbecue. Calum spend his childhood holidays on Brancaster’s wonderful beach, and his family later moved to the area. We have since spent many happy holidays in North Norfolk enjoying both glorious summer days and blustery windswept winter weekends on the beach with our three children. For us Norfolk is a magical place and we love the village of South Creake, so when The Chantry came on the market for the first time in 35 years, we jumped at the opportunity to look around it, and we were instantly bewitched by its charm and the beautiful barn and gardens. The house was in need of major TLC, so we spent many evenings planning how best to restore it whilst maximising the space and light, enhancing the views out into the garden and being true to its own period character. We bought a property in North Norfolk because so many of our happiest memories stem from here. We toyed with buying somewhere in the Alps, or where the sun is guaranteed to shine, but there is something wonderful in returning to a place that you know and love. A place with huge expanses of stunning beaches; pretty Norfolk villages with cottages build in flint and brick; the market towns of Holt and Burnham Market with their boutique shops; the farm shops and artisan producers and a mass of fabulous places to eat. We had spent enough time in Norfolk to know that it is just as special in the snow, the wind, or a spectacular thunderstorm as it is on a hot balmy day – you just need to be prepared for all eventualities (including sunbathing on the beach at Easter in 2011!). The house is located up a quiet lane and has views over meadows, its own large, enclosed garden and to the church. The large, open plan kitchen is wonderfully light and is a great place for lengthy lunches. The downstairs bedroom is great for older children in search of some privacy or equally for people that find climbing stairs harder than they would like. A separate playroom and sitting room means there is space for children to make a racket, whilst allowing you some down time. The table tennis table in the barn makes for an entertaining evening and for younger children, the large laurel shrubs provide a perfect setting for making a den or playing hide and seek. The bowling lawn provides space to play cricket, football, badminton etc (don’t forget to pack the them!). Family bathroom has a freestanding double ended designer bath, loo & basin. Family shower room has a high pressure Grohe shower, loo and basin. Master bedroom has an ensuite shower room with a high pressure Grohe shower. The Beach Hut Suite bedrooms share a downstairs shower room with shower, loo and basin. All bed linen provided We also provide hand towels and tea towels, but not bath towels. Open fire in the sitting room. Wood provided. Sitting room with 3 sofas, open log fire, 37" HD LCD TV & Blu-ray DVD. Playroom for the kids to escape their parents. Large entrance hall with log fire. Tea & coffee, sugar, spices. Washing up liquid, dishwasher tabs, bin liners, tea towels. A wide selection of dishes and utensils to cater for larger groups. Open plan kitchen with: Handmade shaker style kitchen with granite worktops. Range cooker, microwave, dishwasher, fridge/freezer. Oak dining table & chairs (seats 14). Leather sofas. TV Large glass sliding doors opening onto the garden. One in the kitchen, another in the sitting room - iPhone compatible. The barn acts as a games room for wet days, and includes a table tennis table and darts board. Please note that barn is not converted or smart, and is more often frequented by wildlife than cleaners! Table tennis table. Dart board. Various puzzles, board games & Jenga. Croquet. Toy kitchen and tea set, wooden train set, dolls, blackboard, hobby horse and other miscellaneous toys. Garden swing. The garden extents to over an acre, with wonderful places to make a camp, hide from the adults, kick a ball, play croquet or simply read a book or fall asleep in the sun. There are tennis courts in the village. Grass courts in South Creake and hard courts in Burnham Market welcome visitors. The Royal West Norfolk golf course at Brancaster is a links course set on the North Norfolk coast. With the North Sea on one side and the saltmarsh on the other it has a wonderfully atmospheric setting, and is ranked 17th in England and 44th in the UK by top100golfcourses.com. Visitors are welcome, although numbers are strictly limited. This, together with the fact that only two-balls are allowed, keeps the speed of play up, with most rounds being completed in three hours. The ground floor is all accessible by wheelchair, including the ground floor bedroom, shower room and loo. Outside: Our private garden is nearly an acre in size. There is a large area of lawn, a cutting garden where flowers are grown for the local church, mature flower borders and spectacular specimen plants such as the Wisteria that covers the flint barn in the garden, home grown magnolias and clematis. There is also a large patio, garden furniture and barbeque. The whole garden is fenced and while this is fine for our dogs and children, it is not Alcatraz and renters must make their own assessment as to its safety. There are no ponds, pools or other open water in the garden. Utility Room: Boot room for dogs, coats & wellies. Washing machine. Cleaning / Towels / Linen / Maid service: Percale bedlinen is provided for all beds and changed weekly. All beds (except the master bedroom) have anti allergy duvets and pillows. All twin rooms have blackout curtains. Tea towels and bath mats provided but please bring your own towels. Oh my, what a fabulous weekend we had at The Chantry, its a splendid house to get the family together, we celebrated our 40th Wedding Anniversary plus our big Birthdays that are approaching with our children & grandchildren , a total of 11 in all. The Chantry had more than enough space to accommodate all of us. The rooms are of a good size, the kitchen dinner was great, very well equipped, really nice for all of us to sit and enjoy meals together, the garden fabulous, great for a game of hide and seek. We are already planning to visit the The Chantry again for another family weekend. Thank you so much for taking the time to review The Chantry. We are delighted that you love The Chantry as much as we do, and we look forward to welcoming you back again in the future. Fantastic weekend! We used the cordage for family and friends for my 50th birthday celebration. The cottage was exact to discription and even more,cosy, clean and had everything that we needed. Siutuated in a perfect location with loads to do in the area. We will be visiting again! A lovely house, despite its size it felt very homely. The owners have put a lot of thought into everything you might need to make your stay comfortable. The description of the property was accurate, the property was better in reality than the photos. The property was spotlessly clean and well maintained. The beach hut room was a hit with the children we had staying in our group. There was also a children's playroom with lots of toys and games. We had a problem with the heating when we were there and the owners were quick to sort it out, they also left a welcome pack which we didn't expect, they were also very helpful with places to visit in the surrounding area and places to eat. We would definitely stay here again and would highly recommend it to friends and family. We ate at the Lifeboat inn, Thornham they were very accommodating as we had prebooked a table for 13 plus highchair and 4 dogs, but the food was slightly disappointing compared to other pubs in their group. A lovey house in a lovely part of the country, everyone enjoyed it from the age of 2 to 80 years old. Katherine was very helpful when booking The Chantry. Have just returned from a fantastic week staying for New Year at The Chantry with some family friends and their children. You will not be disappointed if you rent this holiday home. It's situated down a quiet lane opposite beautiful fields and the duck pond. The property itself is extremely well designed and great for groups with the open plan kitchen/diner.seating area that looks out onto the beautiful gardens. The kitchen is extremely well designed and is very well stocked with plenty of crockery etc for a large group. The cosy lounge with open fire had plenty of comfortable seating for us to relax and enjoy. Our children were older so the playroom wasn't used but I can imagine if you have young ones then it's ideal for them. Our teenagers loved the area for table tennis and darts even in the cold. I can imagine in the summer it's superb and plenty of space in the beautiful garden . The beds were extremely comfy with lovely linens too and the large luxury bath a real treat. Showers were all excellent too. All in all I would definitely recommend this property and the owners were really helpful with our booking - the welcome fizz and beers a treat too thanks Katherine. We love Norfolk as an area with plenty of beach walks with the dog. Would recommend Wells-next-sea, Brancaster, Holkham Beach and Holkham Hall plus Sherringham. The Chantry is just 6 miles from the sea, with the spectaular beaches at Brancaster, Holkham, Burnham Overy Staithe and Wells all just a short drive. South Creake is 4 miles from the Georgian market town of Burnham Market with its excellent butcher, baker, fishmonger and boutique shops plus the famous Hoste Arms pub, hotel and restaurant. Fakenham lies 6 miles to the south and has larger shops, supermarkets and a cinema. Brancaster Beach, Holkham Hall and historic Walsingham are all within 10 minutes. Booking Notes: Before booking we suggest you visit our website for more information via our website: http://www.norfolkchantry.co.uk/ If you have any questions about the house then please don't hesitate to contact us. Changeover Day: Changeover day is Friday, although this may be more flexible in low season. Notes on prices: In low season shorter lets are available, please contact us for more information.